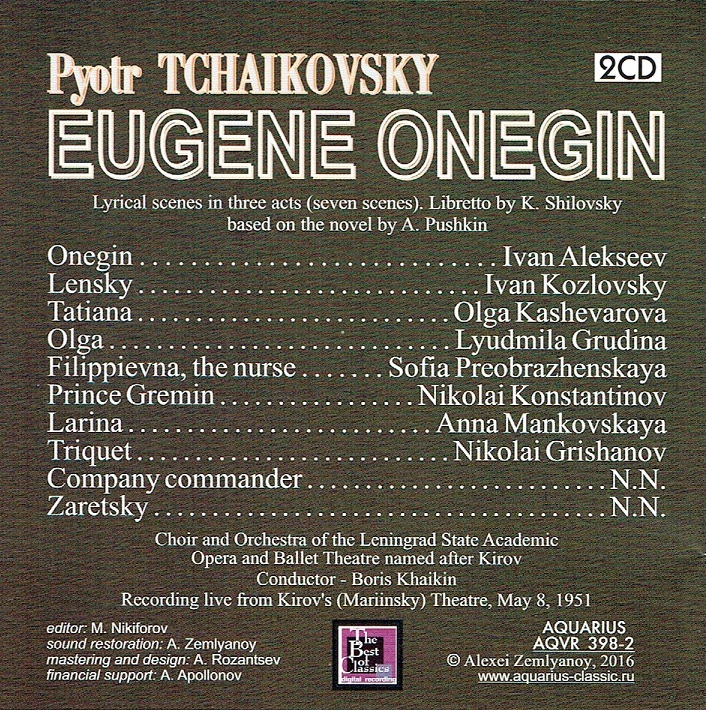 “There are two studio-made recordings of EVGENYI ONEGIN with the great Ukrainian tenor Ivan Kozlovsky as Lensky. The first was made in 1937 with Melik-Pashaev conducting (and has been released on Naxos [OP0146]), the second in 1953 with Orlov conducting (released on Myto and Preiser). Both are classics, and serious collectors either already do or should have at least one of them. But what we have here is something very special, and also something we haven’t had an opportunity to experience: Kozlovsky in a live, staged performance. I am not aware of any other in-performance recording of an opera featuring this superb singer. 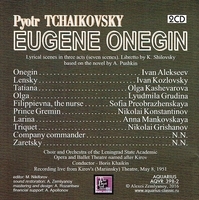 Although he was virtually the house tenor at the Bolshoi in Moscow, in 1951 Kozlovsky did appear at the Kirov Opera in Leningrad (now the Mariinsky Theatre in St. Petersburg). This recording has never been released before in any form of which I am aware, and one is grateful to Aquarius for securing it, and to Norbeck, Peters & Ford for making it available (www.norpete.com). The sound quality is good - what I’d call standard 1951 monaural broadcast sound, a bit constricted but rich enough to serve the orchestral and vocal colors well. The performance as a whole is excellent, conducted with both urgency and appropriately melancholy shades by Boris Khaikin. 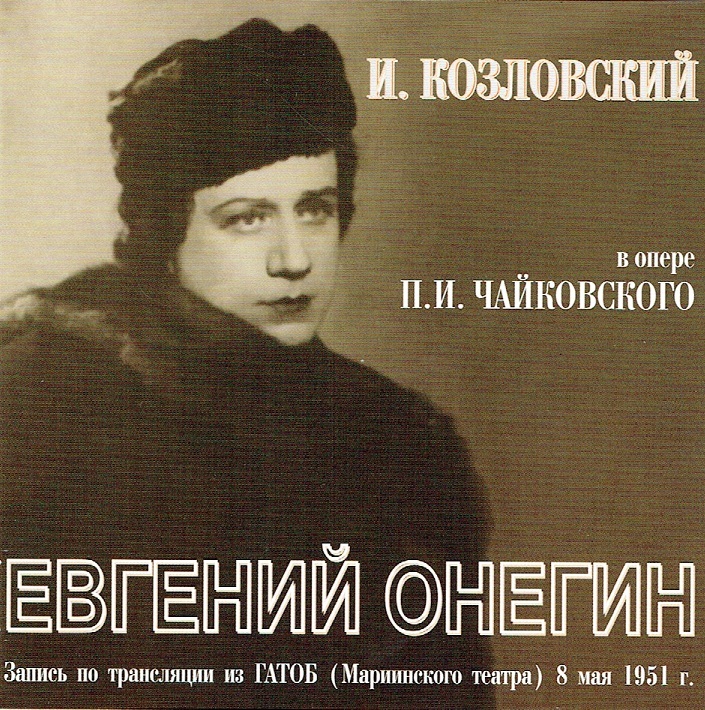 Olga Kashevarova is a lovely Tatiana, with a rich spinto voice that lacks the edge of so many Slavic sopranos. Her tone positively glows throughout the range, and she brings strong dramatic skills to the role as well. Her Letter Scene is impassioned, sung with genuine sweep and ardor. Ivan Alekseev also brings a warm baritone timbre and dramatic insight to the title role. He sang at the Kirov for 30 years, starting in 1945, and one can hear why he was one of their prime baritones, though his voices lacks the unique timbre and brilliance of Lisitsian. But the central reason for this set is Kozlovsky, a unique artist heard in one of his signature roles. As good as his two studio recordings are, here he is enlivened by the presence of an audience and the momentum of a staged performance. His entrance is greeted by an ovation, as is his singing of Lensky’s big aria. The excellent accompanying notes tell us that the audience demanded and got an encore of that aria, but it isn’t included. His singing of the aria encapsulates everything about Kozlovsky that made him so distinguished: a huge range of dynamic shading with an infinite variety between pp and ff, a limitless imagination for phrasing, and a remarkable ability to hold the audience through pauses that would kill the performance of any other singer. Many famous tenors have recorded this aria, but none compares to this account. It stands as a supreme example of vocal mastery. Kozlovsky’s overall performance is more than just a magnificent rendering of one aria. Throughout, this is singing with a real face. Kozlovsky’s Lensky is a believable young poet and a dreamer, emotionally full throttle at every moment. What we hear is one of the great opera portrayals of all time, preserved in the heat of a live performance. If the word ‘historic’ applies to anything, it applies to this recording.